Elias Riggs Monfort was born March 2, 1842 at Greensburg, Indiana, son of Joseph Glass Monfort, D.D., LL.D. and Hannah Conger Riggs. When he was 13 years old, the family moved to Cincinnati, Ohio. He attended Hanover College in Indiana before his studies were interrupted by the war. He enlisted June 18, 1861 as a Private in Company A, 6th Ohio Infantry. On October 5, 1861, he was promoted to Second Lieutenant and transferred to Company F, 75th Ohio Infantry. 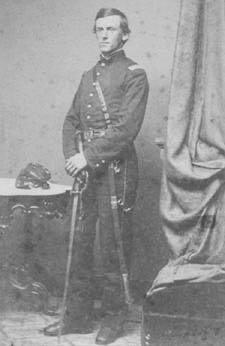 He was then commissioned First Lieutenant of this company on May 15, 1862 and Captain of the same on January 12, 1863. He participated in 20 engagements, among which were the following: Phillipi, Laurel Hill, Carrick's Ford, Monterey, Shaw's Ridge, McDowell, Franklin, Strausburg, Cross Keys, Cedar Mountain, Freeman's Ford, Waterloo Bridge, Sulphur Springs, Second Bull Run, Chantilly, Chancellorsville, Fredericksburg, and Gettysburg. In the last battle, he was dangerously wounded, July 2, 1863, which made it necessary for him to submit to repeated surgical operations, the last occurring in June 1911. He was discharged on account of his wounds in January 1864. After the war, he continued his studies at Hanover College, going about on crutches, and graduated in 1865. Having decided upon a legal career, he then entered the Cincinnati Law School, from which he graduated and was admitted to the bar. He began practice at Greensburg, Indiana. He continued for eight years until failing health forced him to retire from the legal profession. He became prosecuting attorney of the Fourth Judicial Circuit District of Indiana (two years) later, a district attorney of the Twenty-Second District of Indiana (two years). Returning to Cincinnati to make his home, he later entered the service of The Herald and Presbyter, of which he rose to the position of editor in 1875 and continued as such for 20 years. 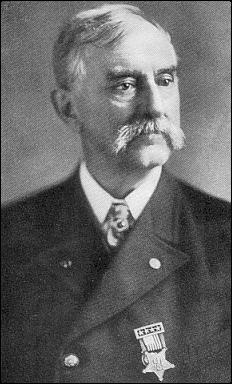 In 1896, Mr. Monfort was elected clerk of the Court of Common Pleas of Hamilton County, Ohio and served one term. He was selected in 1899 by President McKinley to fill the responsible position of postmaster of the city of Cincinnati. He held this position for 16 years, resigning January 1, 1915. He was a life member of the National Association of the Postmasters of the First Class and of the Ohio State Historical Society. Mr. Monfort became half owner of The Herald and Presbyter and was president of the Mamolyth Paint Company until 1914. At one time, he was a director and trustee of 14 different organizations. He was a loyal supporter of the Republican party and, fraternally, he was a thirty-second degree Mason, and a Knight Templar. He was Commander of the Grand Army of the Republic (GAR) Jones Post #401 in 1890, Commander of the GAR Department of Ohio in 1900, Commander of the Ohio Commandery of the Military Order of the Loyal Legion of the United States in 1906, and in 1915, he was elected Commander-in-Chief of the GAR at the National Encampment at Washington, DC, having refused the position three times on account of obligation to public service. Mr. Monfort attended nearly all of the Ohio State encampments and was 28 times a representative at the National Encampment. Mr. Monfort was married September 6, 1867 to Emma A. Taylor, who passed away October 24, 1914. They had three children, Joseph T., Hannah Louise, and Margaret M. Monfort. Elias Riggs Monfort died in 1920.